This is a spectacular Z scale model from an actual Danish design. This class of feeder ship debuted in the early 1990s, and new ones are still being built. 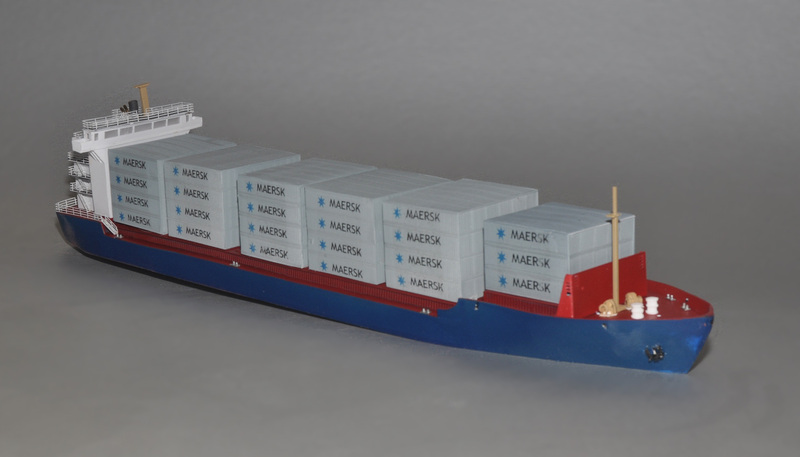 This ship has a capacity of about 540 TEUs, or 270 40′ containers. At just over 20″ long, it will fit in small harbors. I’ve seen this class of ships all over the world, either in person or through Google Earth, from both large and small shipping companies. It has a side-launched rescue boat. I’m showing it with a full load of containers—the container stacks are not included, and are available separately. The ship has custom photo-etched railings and stairways, and many custom details such as winches, masts, ventilators, davits and lifeboat. A built-up model, custom painted and decaled, without containers, is $750.00 US, plus shipping and insurance. An undecorated full load of containers (three high, not four as shown) is $100.00 US. A load of containers painted and decaled is a special order; ask for a quote. A complete kit containing all details (but not the load of containers, and commodities like paint and glue) is $225 US, plus shipping. Here is a slightly earlier, less expensive (in real life) version that perhaps a charitable foundation would buy rather than the latest, most expensive versions. The bridge is much simpler; the cranes just a bit less capable, and the rescue boat has a side “free” release. Brely noticeable are the platforms included for the open holds. These position a row of containers at the correct height. While the spotlight is often on the now 20,000 TEU ships that ply transoceanic routes, these smaller feeder ships far outnumber them. 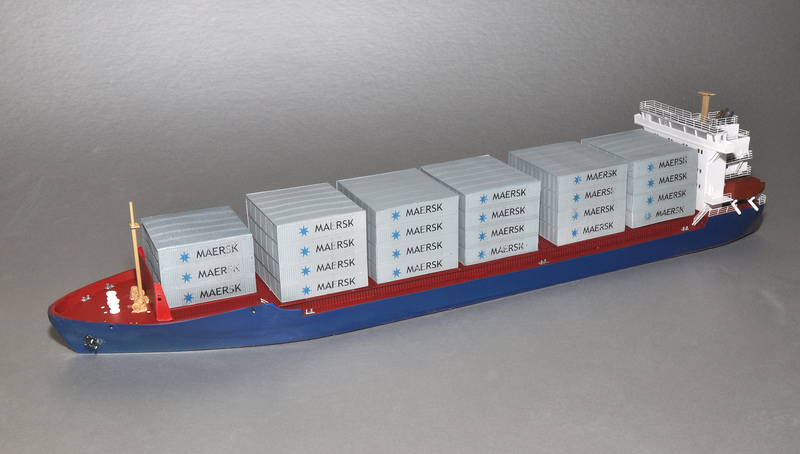 Here is another Maersk version, with a new overhanging bridge. I should note that Maersk and many of the transoceanic lines are abandoning this class, leaving the traffic to smaller operators, of which there are hundreds or perhaps more. All the hatches are closed on this version. Only the No. 1 hold can’t be open–well, No 1 can be open, but requires some extensive surgery on the bow interior structure. In N scale, the model is 28″ long, 4.5″ high and about 5″ high. The price is $375.00 plus shipping, which is about $20.00. is this ship still available? Yes it is. I am currently moving from Ohio to Alabama, so it will be a few weeks before I am back in full production.